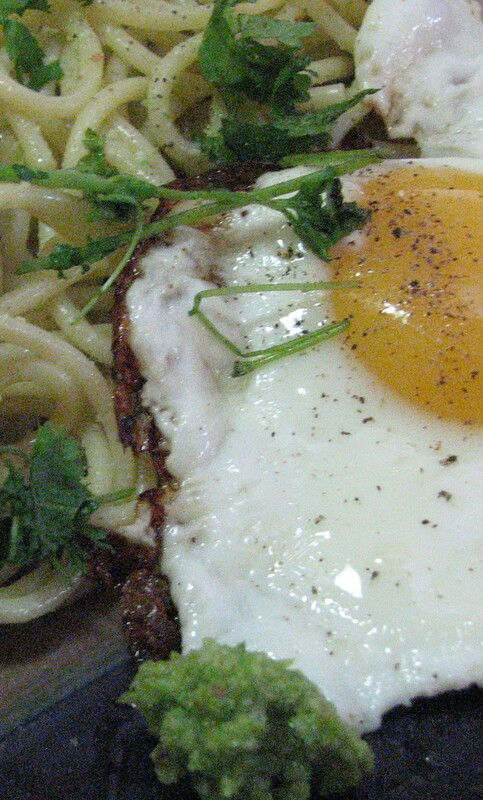 For our first Central Brooklyn CSA Blog Meal we made garlic scape pesto and spaghetti, served with a farm fresh fried egg, garnished with fresh cilantro and black pepper: it tastes as awesome as it sounds! Many of us who picked up our first week of vegetables from Central Brooklyn CSA had the same question: “what in the world is a ‘garlic flower’ and what do I do with it?” Alas, there is nothing to fear, garlic flowers (or, as they are sometimes called, “garlic scapes “) are delicious and just happen to be the centerpiece of our first Central Brooklyn CSA Blog Meal (feel free to help us come up with a better title for the blog meal, too)! Garlic flowers are members of the Allium family, along with onions, leeks, and scallions. And, yes, as the name implies, these curvey tubes are in fact part of the garlic plant. Famers cut the superfluous stems and buds off of garlic bulbs (or heads, as we call them once harvested) to focus the plants energy on the bulb and not the stalk and flower. The best part of this story is that the flower and the stalk of the garlic – the scape – are not only edible, they taste great. Similar to the way the green “tails” on leeks and scallions have a milder but definitive flavor that is consistent with their respective bulbs, garlic scapes taste like garlic. After breaking off the woody stem (much like asparagus) the entire scape is edible, including the flavorful flower bud. Garlic flowers are great in recipes where you crave the flavor of raw garlic but are wary of drowning out the tastes of other ingredients. So now that we know what a scape is, what do we do with it? For a food that we rarely see on grocery store shelves, garlic flowers are remarkable versatile. Their mild garlic flavor makes them ideal to substitute for fresh garlic cloves in many recipes. The shape of the stalk makes they very convenient for using as a tasty garnish (like scallions and wild onions), and their heartiness even allows for them to be roasted (you can stop drooling any time now). But as our very unscientific Google search confirms: most cooks who use garlic flowers love to put them in pesto! Pesto, of course, is a green sauce famous in Italian cooking made with fresh basil, garlic, pine nuts, parmesan cheese, olive oil and lemon juice. But some inventive Bistro (re: fusion) chef’s have reconceptualized pesto and expanded our notions of green sauces, much to our taste buds collective delight. For our first Central Brooklyn CSA Blog Meal we decided to try out a delicious sounding garlic flower pesto recipe and so we made scape pesto spaghetti, served with a farm fresh fried egg, garnished with fresh cilantro and black pepper. Yep, it tastes as awesome as it sounds! After sifting through about a dozen garlic flower pesto recipes, we settled on Dorrie Greenspan’s in no small part because we had all of her ingredients readily available. For us, part of eating sustainably means not buying impractical ingredients just to make one recipe, but finding ways to adapt recipes and using what is already in your kitchen in new ways. 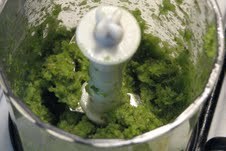 If this recipe requires things you do not often eat, sub in what you have in your cupboards or by all means go out and find another garlic scape pesto recipe on the web– they are plentiful! * If you have a blender you can put nuts in, this recipe is a breeze. If not, it is still very doable (and worth it), it just requires about 10 minutes more. 1. Break the woody ends off your garlic scapes. Simply hold the plant firmly in one hand and with your thumbs, snap the stem where it “wants” to break. If you have ever cooked asparagus, this is exactly the same. Discard the woody end. Wash the remaining scape in warm water to remove any dirt. 2. If you have a blender that can handle chopped almonds, rough chop your scapes and nuts, combine them in your blender and skip to step 5. 3. If you do not have a blender, on a good sized cutting board, very finely chop your garlic scapes. When you are finished, place the scapes in a medium sized mixing bowl. 4. Crush whole almonds by placing them in a kitchen towel and wailing on them with a rolling pin. Be careful not to break your kitchen. Very finely chop your crushed or sliced (toasted) almonds on the cutting board. Add the almonds to the scapes in the mixing bowl. 5. Grate your cheese over the almond/ scape mixture. 6. Add about a tablespoon of oil to the mix and blend or stir vigorously. Continue adding oil and blending/ mixing until you have reached your desired consistency. 7. Add sea salt, a little at a time, mix and taste. If needed add more sea salt. That is it! What makes this pesto so great is that the flavor from every ingredient is accessible and definable. The garlic flowers give you the full effect of garlic but do not overpower the almonds, parmesan, olive oil, or even the sea salt! The rest of the meal is easier than the pesto (if that is possible). We boiled restaurant style spaghetti with sea salt and olive oil (the noodles are a little thicker which adds a decadent dimension to the pesto! ), and when they were cooked, drained them, rinsed the pot (to remove the starch that cooks out of the pasta) and then simply combined the pasta and pesto (a tablespoonful at a time) in the same pot. Remember it is best to add the pesto slowly and use as little as needed. You can always add more and no one likes an over-seasoned dish. Then we quickly fried eggs in oil over a cast iron pan (we moved with alacrity so we could serve our eggs over warm spaghetti). There is oil in the pesto, so if using as little oil as possible is your thing (and there is nothing wrong with that), you may want to oil your fry pan very judiciously. Finally, while the eggs where finishing up, we rinsed, dried, and rough chopped some fresh cilantro. Plate your meal up (if you want to sop up your yolk with noodles – yes please – serve your eggs on top), garnish with cilantro, fresh black pepper (to taste) and 1/3 teaspoon of pesto (for your egg) and enjoy! Or you can poach your egg in the pasta water – just fish out the spaghetti instead of dumping the water – no oil! What a delicious meal. I haven’t received any scapes in my CSA but I do get onion flowers and haven’t known what to do with them other than to chop them into salads. I love eggs too so your meal is particularly appealing. Previous Previous post: First Distribution!